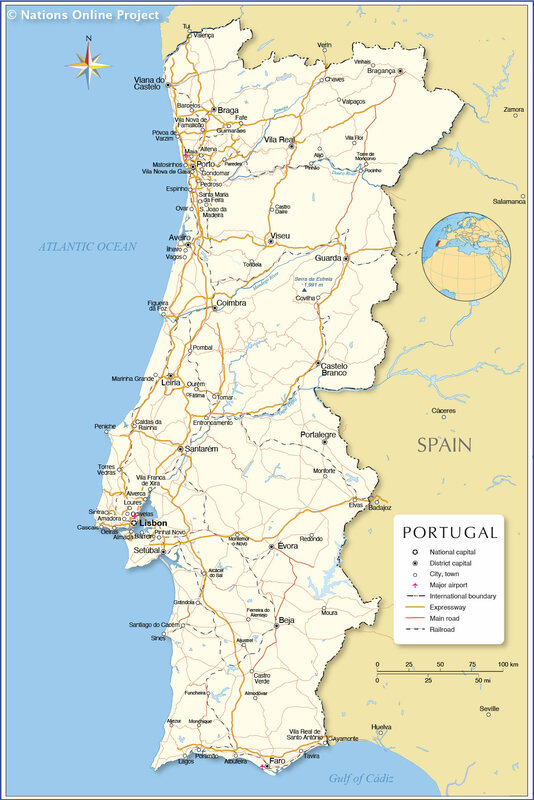 Portugal, officially the Portuguese Republic (Portuguese: República Portuguesa) is a sovereign state in western Europe, it comprises of the continental part of Portugal on the western coast of the Iberian peninsula and the archipelagos of Madeira and the Azores in the Atlantic Ocean. The most western European state is only bordered by one other country--Spain, in north and north east. Portugal shares a maritime border with Morocco. With an area of 92,090 km² Portugal is compared slightly smaller than Hungary (93,028 km²), or the U.S. state of Indiana. Portugal has a population of 10.4 million people (2014); capital and largest city is Lisbon with about 550,000 inhabitants. The cooler and rainier northern part of the country, to the north of the city of Castelo Branco, is apart from the coastal areas, mostly montainous with elevations up to almost 2000 m in the Serra da Estrela, with Torre 1,993 m (6,539 ft) as the highest peak in the mountain range, represents the highest point in Mainland Portugal. The southern part of the country which extends as far as the Algarve, consists mostly of rolling plains with a climate somewhat warmer and drier than in north. Portugal's main rivers are the Douro river with its tributary the Tamega river, the Rio Minho, which forms part of the Spanish/Portuguese border in north west, Rio Mondego, the longest river which flows exclusively in Portuguese territory, and the Tagus (Rio Tejo), the longest river on the Iberian Peninsula. The southernmost province of Portugal, on the Atlantic coast with its capital, Faro is a major tourist destination in Europe. The island of Madeira is located in the Atlantic Ocean 520 km off the north west African coast. The group of islands constitutes an autonomous region of Portugal. 270,000 people live on the islands (2012). Capital city is Funchal. Madeira is a popular year-round tourist destination, visited annually by about one million people. The Azores are a group of nine volcanic islands in the Atlantic Ocean, located about 1,500 km west of Portugal with a population of 245,000 people (2012). The archipelago is in Portuguese possession but partially autonomous. Largest city is Ponta Delgada on the island of São Miguel. Map is showing Portugal and neighboring Spain with international borders, the national capital Lisbon, district capitals, major cities, expressways, main roads, main railway lines, and major airports. Click on the country/state name on the map to get the respective country or federal state (Bundesland) profile or use the links below. Click on the (state capital) city name for a city map. Porto (Oporto), Portugal's second-major city and capital of the District of Porto, 2 million people live in Porto's metropolitan area. Vila Nova de Gaia, located opposite Porto at Douro River (population 180,000; part of Porto Metropolitan Area). Amadora (pop. 177,000), a city and municipality in Lisbon Metropolitan Area. Braga (pop. : 175,000), capital of Braga District. Agualva-Cacém (90,000), a city in the municipality of Sintra in the Lisbon Metropolitan Area. Albufeira, Alcácer do Sal, Alfena Vila Nova de Gaia, Alijó, Aljezur, Aljustrel, Almodôvar, Alverca, Amadora, Aveiro, Barcelos, Barreiro, Beja, Bragança, Caldas da Rainha, Cascais, Castelo Branco, Castro Daire, Castro Verde, Chaves, Coimbra, Covilha, Elvas, Entroncamento, Espinho, Évora, Fafe, Faro, Fátima, Ferreira do Alentejo, Figueira da Foz, Funcheira, Gondomar, Grãndola, Guarda, Guimarães, Ílhavo, Lagos, Leiria, Loures, Maia, Marinha Grande, Matosinhos, Monchique, Monforte, Montemor-o-Novo, Moura, Odivelas, Oeiras, Ourém, Ovar, Paredes, Pedroso, Peniche, Pinhal Novo, Pinhão, Pocinho, Pombal, Portalegre, Portimão, Porto, Póvoa de Varzim, Redondo, S. Joao da Madeira, Santa Maria da Feira, Santarém, Santiago do Cacém, Seixal, Setúbal, Sines, Tavira, Tomar, Tondela, Torre de Moncorvo, Torres Vedras, Vagos, Valença, Valpaços, Viana do Castelo, Vila Flor, Vila Franca de Xira, Vila Real, Vila Real de Santo António, Vinhais, and Viseu.